Last week we looked at unity and how we are called to unite under Christ, but at the same time accept the diversity among us. 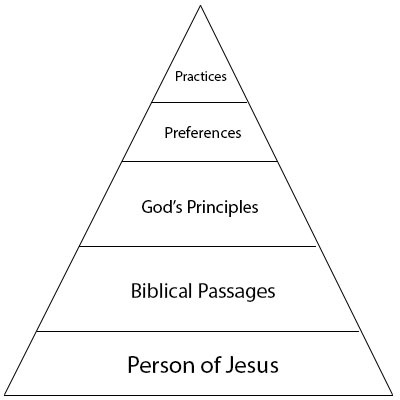 We have ween this pyramid diagram before, but we like to cover this each year to square up our understanding of Biblical unity and diversity. We unite under the person of Jesus, Biblical passages, and God’s principles. We are diverse in our preferences and practices. As we move forward through any given issue, as long as we stay within the unifying foundation, we will grow up and find solutions provided by God. And the more issues we go through with this goal, we will find that we more and more become like the foundation. We are going to look at a couple of different places where Paul and Peter bring these ideas together. Here Paul is revealing that the group at Corinth is arguing about things that show they are disconnected. He even goes as far as saying that he has more spiritual food for them that they are not ready for. He points them back to the foundation laid by Jesus and that we are to build ourselves in unity on top of that foundation. There is no other place worthy of a foundation for our lives other than that of Jesus Christ. In , Peter showed that we are brought to life through Jesus only. Before the foundation of the world, the lamb was prepared for our sins. It is by God’s design. In , he begins getting into the nature of God’s word. He immediately states that there is no room for ideas in our mind that feed what we want. These personal desires that try to build us up and tear others down. Instead, we are to be like newborn babies, to grow and crave the word of God. We all know that babies let everyone when they are hungry. We are to have a controlling appetite of what God has prepared for us. Jesus is the living stone, no some historical bullet point or archeological artifact. He was chosen by God, humans didn’t make this happen. This expression of life is the definition of who we are in unity. So when you look at the pyramid, you see that we are unified with the foundation of the living stone, Jesus Christ. So when we start with the person of Jesus, we then move to the Biblical Passages that tell God’s story on Earth. And as we unify through the person of Jesus, we keep close the Biblical Passages, we then will have revealed God’s principles that apply to everyday life. God equipped his people, to go out in service so that the church will grow. But that is not all. It isn’t about growth, but it is about unity in faith and knowledge in the Son of God and become mature. When we unify under the bottom three foundational areas, we do not find it restricting, but instead, find it a beautiful expression of God’s plan and purpose in our lives.